For dinner tonight, I had a special guest over... my 6 year old nephew. To keep things healthy yet kid friendly, I made something similar to a lasagna (a favorite of my nephew's) - Eggplant Rollatini. Little did he know that it was completely vegetarian! I served this with a baked bone-in chicken breast, seasoned with italian seasoning. Thankfully it was a hit and he enjoyed it... so did the rest of the family. *Tip: You could make this in advance and is freezeable too, just like a traditional lasagna! Preheat the oven to 450F degrees. Spray a large rimmed baking sheet with nonstick spray. Arrange the eggplant on the baking sheet in one layer and spray lightly with nonstick spray. Bake until browned, about 10 minutes on each side. Reduce the oven temperature to 400F degrees. To make the sauce, heat the oil in a medium saucepan over medium hat. Add 2 cloves of the garlic and cook, stirring occassionall, until fragrant. about 30 seconds. Add the tomatoes and 2 tablespoons of the basil; bring to a simmer. Cook until thickened, 10 minutes. To make the filling, spray a large nonstick skillet with nonstick spray and place over medium-high heat. Add the zucchini, onion, and remaining 1 garlic clove; cook until the vegetables are softened, 5 minutes. Transfer to a medium bowl; allow to cool slightly. Stire in the ricotta, parsley, egg, remaining tablespoons basil, 2 tablespoons of the Parmesan, the salt and pepper. To assemble the rollatini, spray a 1 1/2 quart baking dish with nonstick spray. Spread 3 tablespoons of sauce in the dish. Place 2 tablespoons of the filling at one end of each eggplant slice. 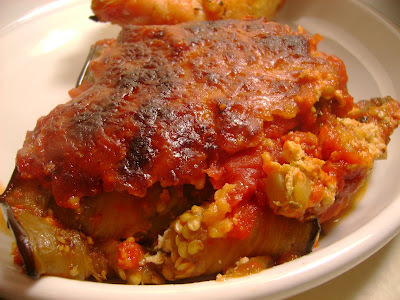 Beginning at the filled end, roll up the eggplant slices and place, seam side down, ina single layer in the baking dish. Spoon the remaining sauce over the rollatinil sprinkle with the remaining 1 tablespoon Parmesan. Bake until heated through completely, about 25 minutes. Everytime I see a gorgeous Italian eggplant dishes I wish it agreed with me more. The eggplant looks great. I've been looking to venture more into vegetarian meals and will definitely try this one out. This looks so good! 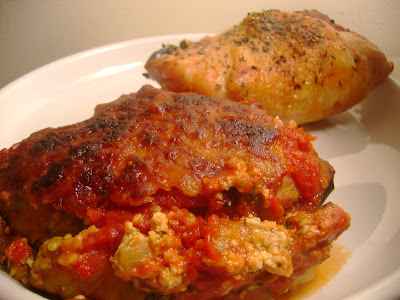 I love eggplant and this looks like a great way to prepare it. It's nice that it's healthy too! I've seen rollatini with zucchini before, but not eggplant. It sounds like a great dish. Did it hold it's shape pretty well? Side note-- is your husband working at Trader Joe's? My checker looked exactly like him, and his nametag said Lou, so I thought it might be him?? Yum. I love eggplant and I don't make it enough. This seems like the perfect excuse. Mmm this looks so good. I can't believe I disliked eggplant for so much of my life. It's so good! This needs to be in my future. In fact, ALL of your (vegetarian) eggplant recipes need to be in my future!! So glad you posted them!